50K MUSIC: Ru, where do you come from? Please tell us a bit about yourself? Ru: I’m originally from the west coast of Sweden. I grew up on the country side and spent most of my childhood in deep forests and on the archipelago islands outside of Gothenburg. Then I lived a year in Liverpool before moving to Berlin, which is now over five years ago. 50K MUSIC: … and where do you come from musically … what are your artistical roots? Ru: My family is a pretty musical one. We all love singing and my grandpa builds violins and a Swedish instrument called the „nyckelharpa“. My father had many guitars lying around and that is probably how I discovered the instrument when I was about thirteen years old. I immediately got really hooked and started my first band when I was around fifteen. Then I went to a high school in Gothenburg with focus on music and arts. At that time I was listening to a lot of indie stuff – bands like „Arcade Fire“, „Sigur Rós“, Laura Marling & Johnny Flynn. Actually these are still some my favourite artists. Later I got into different kinds of traditional folk music. I also played violin in a world-music orchestra for some time. 50K MUSIC: Carlos, you’re from Brazil and live in Berlin now. It’s quite a long way from South America to Germany. Please tell us about your journey. 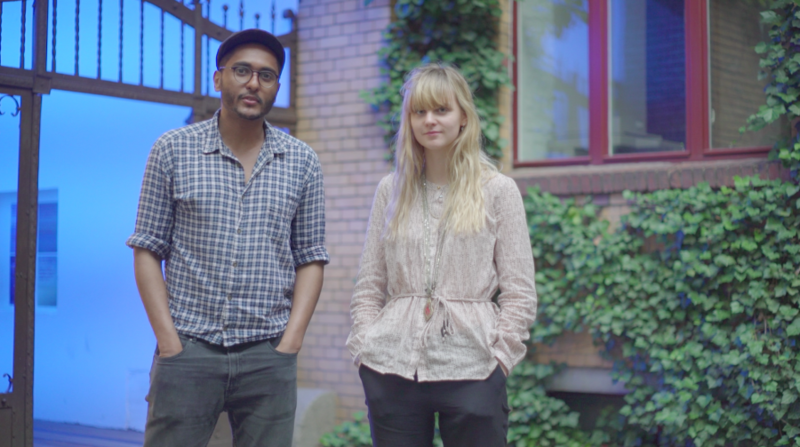 Carlos: I came here, to Germany, 5 years ago because I received a full scholarship from a German institution called DAAD, and after that I did a Masters Degree in Visual Communication at Kunsthochschule Weißensee Berlin. During that time at the university, I met Jonathan, Yuri and Max and we created some projects together with other talented friends. And then we decided to create a Film Collective called The Worldrooms. 50K MUSIC: … and what have you worked on so far? Carlos: We have some projects in development. At the beginning of the year I wrote a TV Pilot of a series called “The Emperor’s Three”. A German partner asked us if we would be able to create a series with elements of Chinese history to be aired here in Germany with some action and fantasy. It was a big challenge to create this universe, because I’m not used writing fantasy or action or anything about Chinese culture. But it’s so interesting to be out of my comfort zone, which is more within the genre of dramas, for example. So, she pitched the project in USA for some possible partners. A few months ago I wrote a script of a science fiction short film called “Hello, World” for a South Germany Funding. We are still waiting to hear the answer. But our next project that is already in Pre production is our new Web Series called “Up, Up”. It’s a comedy about how to survive without money and create a start up at the same time. (laughs) Last year we created our fist webseries, “Blind Data” that has been nominated in a few good festivals around the world. Web series is another format that I also fell in love with. 50K MUSIC: How have you both met? Carlos: I was talking with Yuri, my cameraman and my first film partner here in Germany (We made our first short film here in Berlin called “Smile, Mirror”). We were talking about the post production of a documentary that we did and at the same time talking about music and movies. And I started to explain to him some music vídeo ideas that I have in mind. Two of these ideas were the music vídeos that we are going to create for “Ru”. 50K MUSIC: You’ve started a campaign on Indiegogo together to raise funds for creating two music videos. Are you happy with how it goes so far? What will you use the raised funds for? Carlos: It’s the first time that we’ve launched a crowdfunding and we don’t have any big connection or money to boost it. So, it’s hard. But we are going to create the music videos anyway. Some good friends already decided to help us and that guarantees the basic execution of the ideas and let’s do it, this is an artist project in essence, if we would have a little bit more money it could be so cool for the artists who are going to join us in this project. We would like to create something that transmits a good and beautiful feeling far away from our home and most of the time we need technical stuff to be able to build that, so this means, money, and our crew deserves to be paid as well. This is the main goal of the crowdfunding. 50K MUSIC: Ru, have you got any feedback from your fans on your crowdfunding campaign? Ru: Reactions have been quite good overall I think, which is pleasing. It is the first time I’m doing anything like this, incorporate the songs into more visual concepts and it’s very exciting. 50K MUSIC: And last one: anything you want your Indiegogo supporters and fans to know? Ru: We are really excited about this project and are planning to create something stunningly beautiful and special. Any little help means a lot to make this project come true. After more than seven years I have to pause the mag temporarily due to some family and job-related duties. It's been a real pleasure for me to write for you and work with really dedicated authors over the last years. But now it's time for a respite. Nevertheless if you have any interview or article ideas please drop me a line. Also if you have any articles ready to publish. I'll keep you in the loop. I am - mentor - analyst - coach. Make your music crowdfunding project a proper campaign. With your crowdfunding campaign you can gain much more than funding your upcoming album or your next tour. As an independent music crowdfunding coach I work together with artists to make their campaign a success. I also give advice and support to labels, music publishers, producers and promoters when it comes to the opportunities of music crowdfunding. My services range from developing a detailed campaign strategy to supervising and monitoring the funding stage to social media analysis to evaluation of the campaign.